We are in the midst of a big and busy weekend here in the lovely Adirondack Mountains of Upstate New York. The VISA US Snowboarding World Cup is underway at Whiteface, the Olympic Mountain. The Village of Lake Placid is buzzing with activity, and snow/skiing conditions are superb. The Adirondack backcountry is in excellent shape, with a nice base and plenty of fresh snow. It has been snowing for the past few days so it seems like we always have fresh snow to ski. I am pleased to report the real estate market in the Adirondacks is picking up, and buyers are once again flocking to the region looking for second homes and investment property. 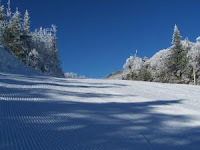 All in all, the Adirondack life is good and skiing's great in New York State; especially in the Adirondacks!